Good: Follows the employee life cycle from candidate sourcing to succession management. Bad: No mobile access. and some users report the LMS module needs work. Bottom Line: Talent management for all industries and sizes. Cornerstone OnDemand is an integrated cloud-based talent management solution. Its solutions is available to companies of all industries and sizes and can work with the company’s existing systems (i.e. ERPs, financial systems, and payroll platforms). Cornerstone OnDemand focuses on recruiting, onboarding, performance management, learning management, compensation, and succession management. Cornerstone OnDemand is also available in Growth Edition for companies with less than 400 employees. 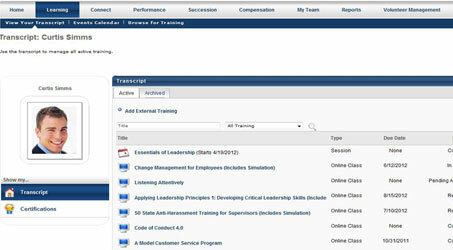 The Growth Edition is dedicated to providing recruiting, performance management, and learning functionalities. Companies can post job opening through multiple job boards via Cornerstone as well as have candidate apply for jobs through the applicant tracking system (ATS). The Growth Edition is available as a subscription price – companies can choose from the learning package ($6 per employee per month), the performance package ($6 per employee per month), or the growth bundle edition ($11 per employee per month). Cornerstone OnDemand also provide solutions that are specific to either the commercial sector (i.e. manufacturing, healthcare, retail) or the public sector (i.e. government, non-profits). Cornerstone OnDemand focuses primarily on the talent management arena, from recruiting to onboarding, to career development to performance measurements. A few of the platform’s standard features are indicated below. However, we want to discuss briefly on the social collaboration features as it is an important concept in HR. The Cornerstone Connect functionality allows employees to collaborate with their managers and each other. Similar to LinkedIn, employees can set up their own profile and request connections with others. Employees can also set up their own tasks or the tasks of their team and share that with others, who then can comment on those tasks. The implementation process for Cornerstone OnDemand’s solutions goes in three steps: Discovery, Desgin, and Execution. The Discovery phase entails assessing the company’s need through questionnaires, demos, and interviews. Once the needs are assessed, Cornerstone OnDemand presents a configuration workshop where they recommend a customer-specific configuration they’ve built. Finally, the Execution phase is the actual deployment. Training is provided by the Educational Services team – they train everyone from system administrators to managers and end-users. They recommend a blended learning approach, such as webinars, self-paced online courses, virtual labs, and live onsite training. Cornerstone OnDemand offers four support packages that customers can choose from: Professional Support Package, Professional Plus Support Package, Premier Support Package, and Premier Plus Support Package. Cornerstone OnDemand provide 24/7 customer support globally via its Global Product Support Team. The Global Product Support handles customer queries on troubleshooting, specific features or functions, and researching complex issues. Customers also have access to the Knowledge base as well as Cornerstone Success Centre if they want to seek advice from other customers. Some users have reported that the interface is not as easy to use or intuitive, especially when working with the LMS functionality. Users are finding it difficult to make changes in the system, such as changing dates or uploading older data. Cornerstone OnDemand does offer mobile capability but it is not marketed and limited in functionality (i.e. not integrated with smartphones or tablets). Cornerstone OnDemand helps organizations recruit, train, manage and engage their employees, empowering their people and increasing workforce productivity. Cornerstone has received multiple recognitions, including Leader for Gartner’s 2014 Magic Quadrant for Talent Management Suites and Leader for Forrester’s 2013 Forrester Wave for Talent Management. Cornerstone also is involved with philanthropic efforts – through its Cornerstone OnDemand foundation, it supports many non-profits with their missions with over 2,400 volunteer hours and $24M in donations.